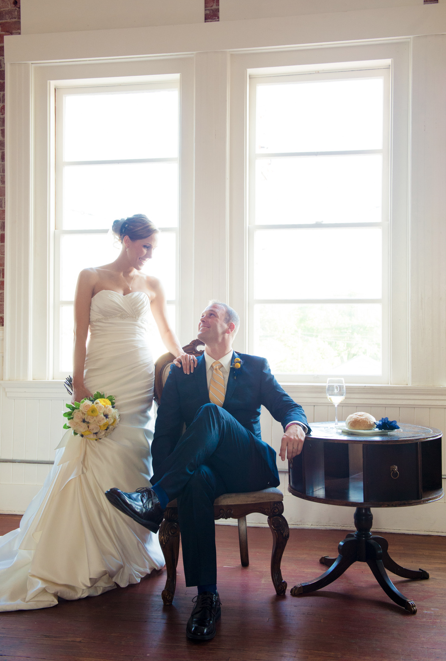 When my husband and I first opened our art gallery, I secretly dreamed of the opportunity to design a wedding amongst the historic brick walls, tall windows and aged wood floors. I’ve been designing weddings for close to twelve years and could of nothing more thrilling to design one in our gallery. Jamie & Jonathan came to me after finding the Loft on yelp.com and knew this space was perfect for them. We started with simple ceremony in the Loft followed by a unique cocktail hour in the Sculpture Park (across the street) before heading back up to the Loft for dinner and dancing. It was a truly beautiful experience designing a simple tasteful unique wedding for an equally unique couple.